Features our first built-in wrist support pad and wrapped in genuine, hand-stitched leather. Use your laptop or tablet all day without any discomfort. Rest Comfy Lite on your lap, table and desk, or set it on your bed. 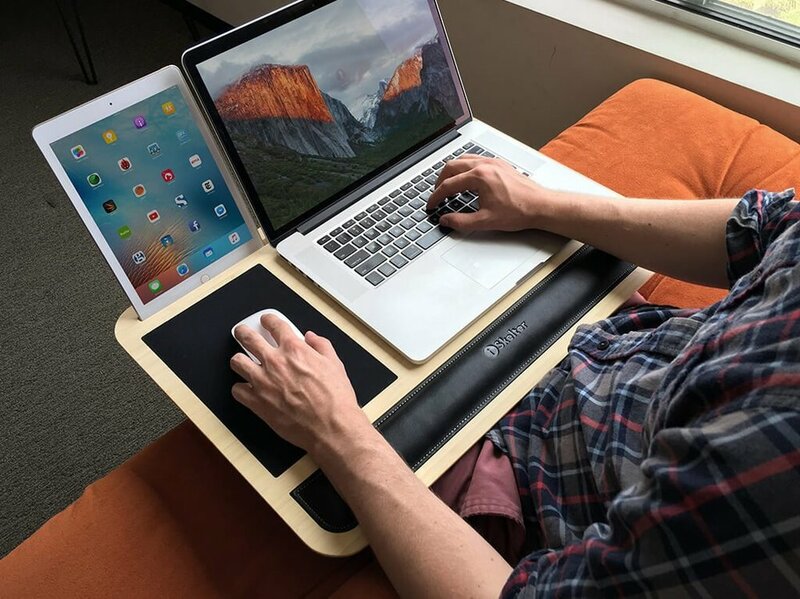 It’s a spacious, multi-device lap desk for a comfortable, mobile workspace. Comfy Lite LapDesk helps keep the laptop cool and protects your laps from continual heat and is absorbed within the material. Secure, viewing dock for your iPhone (iPhone 5/6/6s/7 and Plus Models, Samsung Galaxy, Nexus, HTC, and Blackberry), iPad Mini (All Generations), iPad Air (1, 2, and 3), iPad Pro (9.7 and 12.9) and other tablets including Surface Pro. We developed two unique blends of bamboo with unsurpassed aesthetics and premium quality that offer social benefits to renewable farming. Select from Premium Natural Bamboo and our Limited Walnut Bamboo. Sign up with your email address to receive our product specials.